The R11 mixer is an ideal machine for small to medium scale mixing tasks. It plugs straight into a standard socket and is ready to go. When you need some more mixing power turn to the DISPERMAT R110 & R220. 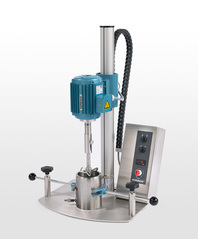 Like all DISPERMATS these mixers are fitted with a complete safety device and a control panel that provides the operator with all of the required process information.